Surfer, writer, environmentalist, Dawn Pier lives on the beach in Baja, Mexico and invites you to join her in her adventures on the sea. In a recent blog, Forgetting Forgiveness, the issue of when to bring up past injustices was discussed. In this case concerning a specific slight felt at the hands of a friend, a long, long time ago. A friend who was no longer in the life, but with whom communication had recently resumed thanks to the miracle of Facebook. It was wondered whether the subject should be raised or just left in the past and forgiveness granted silently. After some days of consideration, the decision was that the issue should be raised. Because, in the words of the advice giver, “trust must be the basis for all relationships.” He felt it was a matter of the trust having been broken between us and that the other must apologise before the friendship could be renewed. In the days leading up to the history composition, a feeling in the gut was felt each time the topic was considered..a subtle sense – call it intuition – that this was not the right course of action. Even as the message was written, detailing the circumstances and their emotional results, the sensation continued – nagging and churning in the pit of the stomach. Despite the misgivings, the friend received the email with great understanding and compassion, even tenderness. It was admitted apologetically, however, that neither the incident nor its long term consequences were remembered. But how was this possible? The pain experienced was recalled with such clarity, as though it had been branded into the soul on that day 27 years ago. And then the larger context of what had happened begged to be understood. What causes suffering? Why do we human beings seem to be in an almost constant state of suffering. Discontent, anger, resentment, bitterness, anxiety and depression seem to be the predominant emotions permeating the planet. It seems to be rare to encounter someone who seems genuinely happy and isn’t just saying “I’m great!” in an attempt to hide the truth or convince themselves that all is well in the world. Because we also share a blindness to each others suffering, the charade of pretending to be happy can be seen as even more tragically ironic. The Buddhists say that life IS suffering. And we are only released from it upon realizing enlightenment. Okay, fine, but what about those of us who are mere mortals a long way from Siddhartha’s Banyan tree? Surely we aren’t meant to go through life suffering day in and day out? What would be the point of that? The answer came a few days later in the form of a book. Eckhart Tolle, in his book “A New Earth: Awakening your life’s purpose,” professes to have the answer to these questions and many more. Most importantly and impressively, he tells us how to end suffering. All suffering. According to Mr. Tolle, the EGO is at the core of all unhappiness and conflict in the world, on an individual, national and international level. Infighting, petty bickering, crime, wars and all manner of conflict, he says, result from egos out of control, trying to dominate and maintain power in the individual and in the world. While it is normal to have an ego – and we all do – the problem arrises when the ego runs the show – suffering can be the only result. To accomplish its end of getting and staying in control, the ego tricks us into thinking “we are it” and that the ego is therefore essential to our very survival. Fear of death is directly the result of our identification with the ego. This ego-indentification occurs gradually as we grow up and mature, becoming particularly combersome during adolescence when self-consciousness, insecurities (all products of the growing ego) become the emotions driving our actions and all too often reactions. The more we identify with the ego, the more we feel separate from the “other” and become blind to the fact that they are experiencing similar emotions. Identification with the ego distracts us from the reality of life. The “beingness” of life that can get us out of the cycle of suffering. The ego, it turns out, is a lot like a whining child looking for attention. The ego likes to bring up the past and make us worry about the future. It is concerned with “I”, “me” and “mine.” It is that part of each of us that clings to the past by identifying so strongly with “our story.” It needs to be right and prove others wrong. It is the voice in the head that never shuts up. It keeps us from living in, and thereby enjoying, the present moment. Mr. Tolle would assert it was the ego that in the present circumstance needed to bring up the past injustice, that needed to be consoled, apologized to, told it was right and the “other” wrong. And that by doing this the ego empowered itself, guaranteed its continued existence and, sadly, continued suffering. Two ducks on a pond meet and begin to fight. Feathers fly and they squawk and honk and make a ruckus. Then, as quickly as it started the fighting ends and they swim away in opposite directions. The ducks then both stretch their necks out and shake all their feathers. They settle and then glide back together as though nothing happened. The duck at the core of the Being urges us to shake out our ruffled feathers and move forward. To let go of the past and recognize that we are all the same at heart, all afflicted by the same suffering. And rather than dredge up old grievances, to be happy that at long last, the lost friend is back in the life. To buy A New Earth: Awakening your life’s purpose go HERE. Very near the new home on Maui is a special place or, more specifically, a special wave. 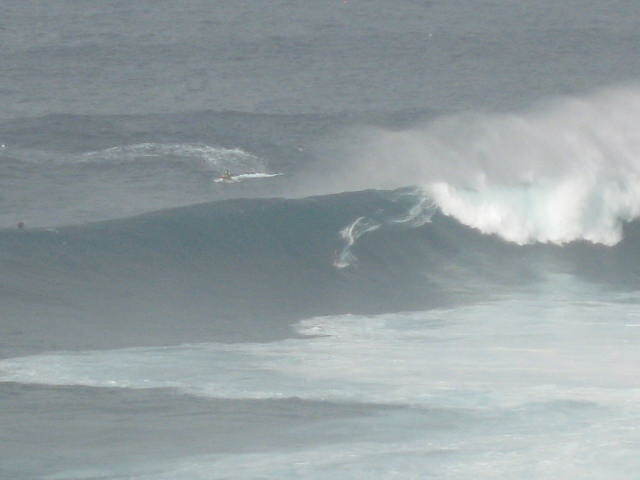 The location is known as Pe’ahi (PAY-ah-hee) and the wave as JAWS. The wave is famous because when the swell direction and size are just right it breaks in a surfable wave that is several stories high. To surf big waves (arguably one greater than 18 feet tall), it is necessary to be incredibly strong so that the speed of the board matches that of the wave. The bigger the wave, the faster the wave and the greater the speed necessary to catch it. Some surfers are purists and believe that the only way to surf big waves is to paddle into them. Others have discovered that the paddling speed limitation can be overcome by the use of personal water craft (PWC) or jet skis, which tow the surfer onto the face of the unbroken wave at speeds equal to or greater than that of the wave. 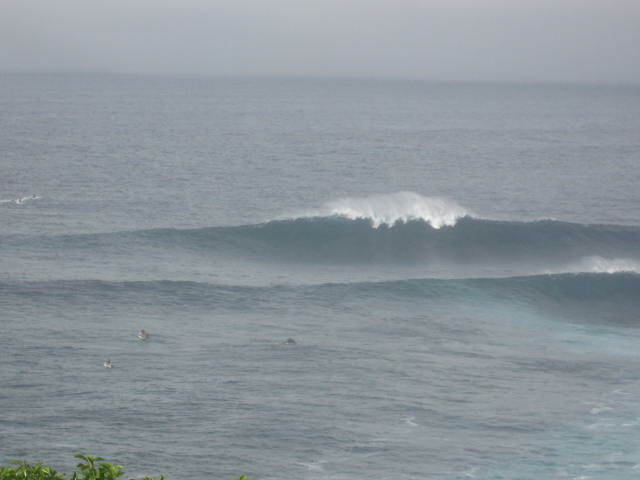 Tow-in surfing, as it is called, has made it possible for surfers to surf waves previously uncatchable – waves like Jaws. Laird Hamilton, a life-long resident of the Hawaiian islands and all-round waterman, made tow-in surfing famous and is undeniably the best big wave surfer in the history of the sport. 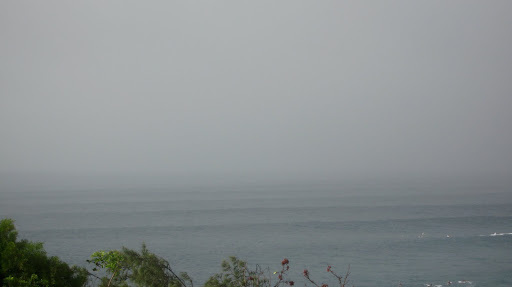 On November 25th, conditions in the bay in front of the house appeared favorable to produce the kind of waves that tow-in surfers need to practice their sport. Waves 30 feet or more in size were looming large and crashing audibly on the rocky point a good mile away. 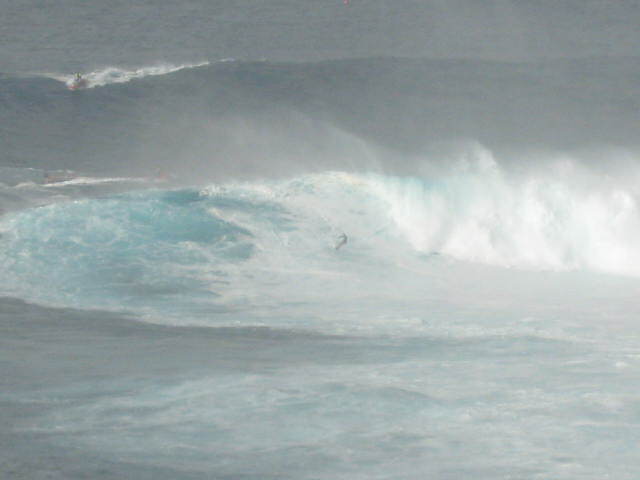 Driving by Ho’okipa Surf break on our way west towards town, the waves were huge and closing out. No one was in the water, an unusual occurrence. 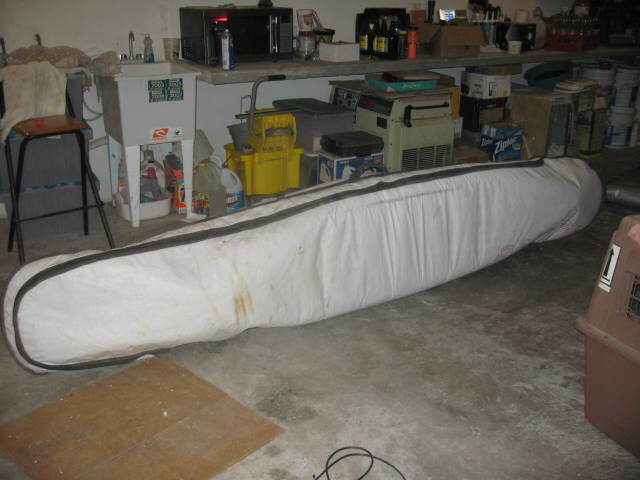 Then on the way back home a neighbor drove by with a PWC hitched to the back of his truck and a rescue board was thrown in the truck bed. That was a sure sign. We drove the 2 miles west and made our way through the pineapple fields that border the surf at Jaws. Cars and more cars were coming and going, confirming my suspicion that today was the day. A crowd had gathered on the cliff overlooking the break. 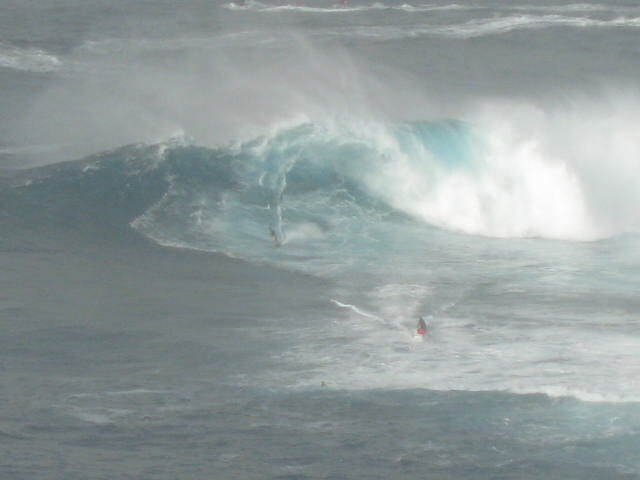 Down below were 15 or more PWC, half of them with surfers on the back or towed by a tow rope. Between where they sat and the horizon was a series of lines or “corduroy” – swell lines, long, deep and intimidating. We watched along with about 30 others from atop the steep cliff that borders the ocean along most of the North Shore. There were serious photographers with big zoom lenses and tripods, locals with video cameras and digicams and European tourists speaking a number of different languages underdressed for the cool, misty weather. As a set approached, two PWCs and their surfers began to jockey for position. The craft moved outside and then turned gradually shoreward. They moved slower than the forming wave, allowing it to catch up to them. The pilot determined where the peak would form and positioned rider accordingly. As the peak began to feather in the offshore wind, the better riders took a line deep into the pit forming below the peak, gained speed and released their hold on the tow line. The sling shot effect gave them added speed and their position on the wave so far away was detected mostly from the trail they carved along the face of the wave. Binoculars made the rider more apparent and the experience more real. As the lip of the wave came thundering down, rider carved up and through the now concave face and then, careening back down the face, gained speed to outrun the jaws of the wave. A collective holding of breath, the crowd mind-surfed the wave with each rider, ooing and ahhing as they cheated death time and again. Wondering at their ability to hold it together as the wind flew up the face of the wave, bringing blinding water with it. Their balance and strength in the face of great opposing forces made apparent to all onlookers. That night lying in bed, the waves pounded the coast, entering the subconscious to become part of the dreamworld where huge looming masses of water, speed and wind surrounded the dreamer. Exhilaration, and the closest thing to flight without wings. To see some incredible video taken at Jaws go HERE. To learn more about Big Wave Surfing Click HERE. 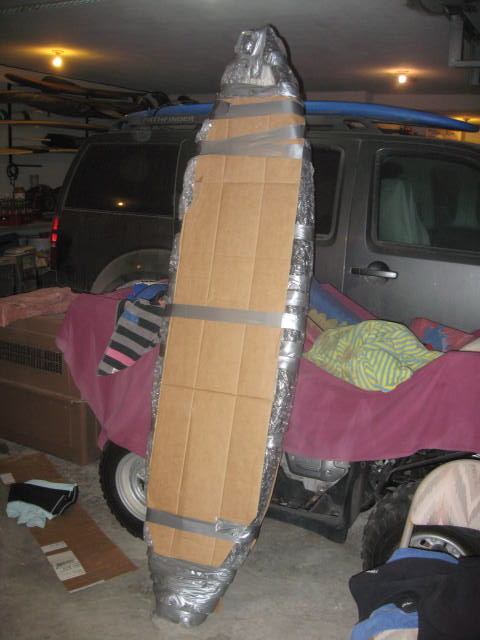 Traveling Surfus: How to package your surfboard for safe arrival at its destination. On November 23rd, travel to the beautiful island of Maui was undertaken. Travel to the Hawaiian islands for this blogger requires transporting equipment to surf. This includes boards, leashes, bathing suits, board shorts, rash guards, sunscreen and surf wax – most of which is very small and portable. All, except the most important piece of equipment, the boards. 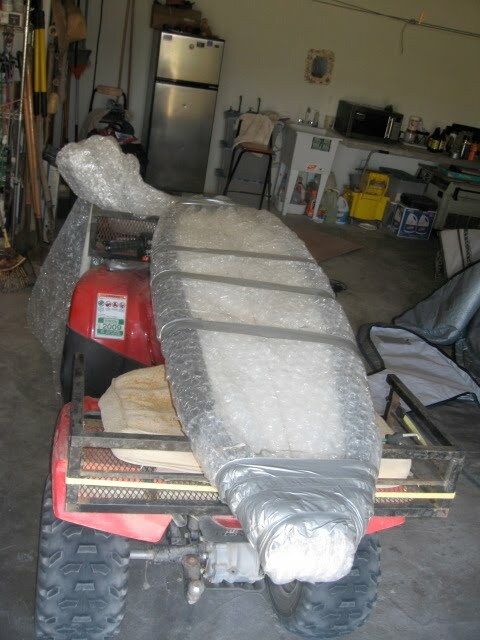 Getting a surfboard from point A to point B, several thousand miles and three plane flights away can be a snap in the most positive sense of the word, provided you have the know-how to package your boards for arrival safely on the other side. Surfboards are constructed of fiberglass over a foam core with a “stringer” made from wood that runs down the center. The stringer gives the board added strength along its longitudinal axis, however, the rest of the board is FRAGILE and susceptible to being damaged or “dinged.” Let’s put it this way, it’s called “fiberGLASS” for a reason. Remember the Samsonite luggage commercial? With this in mind, traveling long distances with a board requires something extra, something special to protect them from the “gorillas” working at the luggage department of your local airport. I recalled my very first surf trip to the wilds of Sayulita, Mexico, where I was schooled in the method by a real So Cal Old Timer. It used to be that fins were fixed, glassed right into the board and I guess some shapers still do this, but it’s increasingly uncommon. 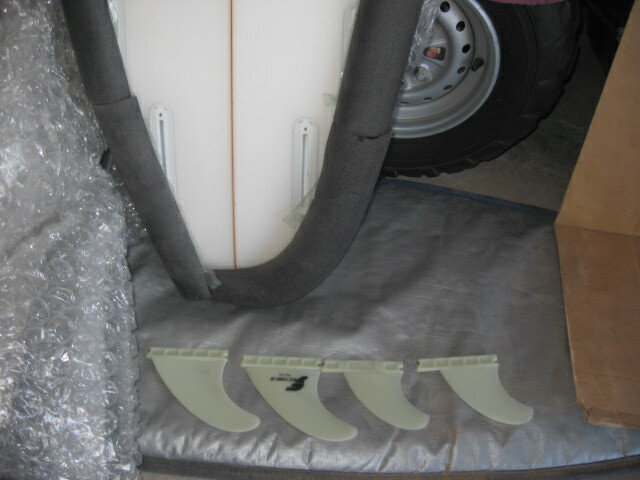 Both the boards to be prepared in this case have removable fins. I packaged each set into Ziplock bags with their respective screws and fin key (two different systems for connecting the fins to the board). Step 2: Protect the rails with 1 inch pipe insulation. Step 3. Wrap it all up with bubble wrap – the big bubble kind. Step 4. Cover the deck and the bottom with cardboard to protect them from projectiles. Ideally one would have a travel bag that is designed to hold more than one board. It is also ideal to have a board bag that is only about six inches longer than your longest board. In this case I have to make due. Fortunately, the “man” has a 10 foot long board that is at least 30 inches wide. His board bag should be an adequate travel bag for a couple of my shorter boards, albeit a good two feet too long. 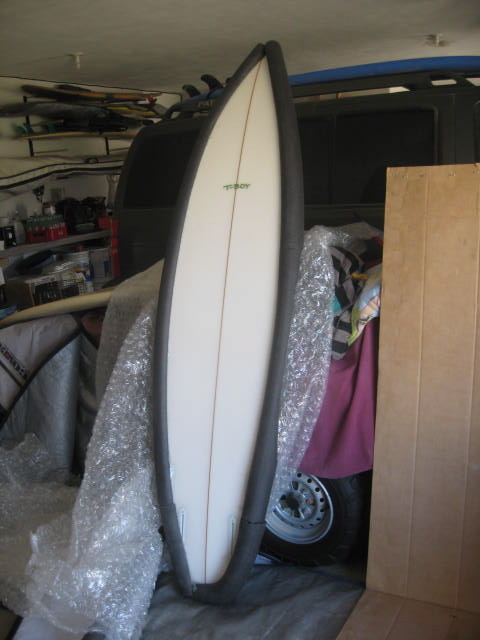 First the 7’6” is placed on the bottom, cushioned by its board bag, then the 6’10” on top of the longer board and its bag is placed on top of that for added cushioning. The noses and tails are wrapped in beach towels and my wet suit. Then the whole thing is zipped…not quite shut. Remember in the 80s when those tight tight skinny jeans were in style (I think they recently tried to make a come back)? 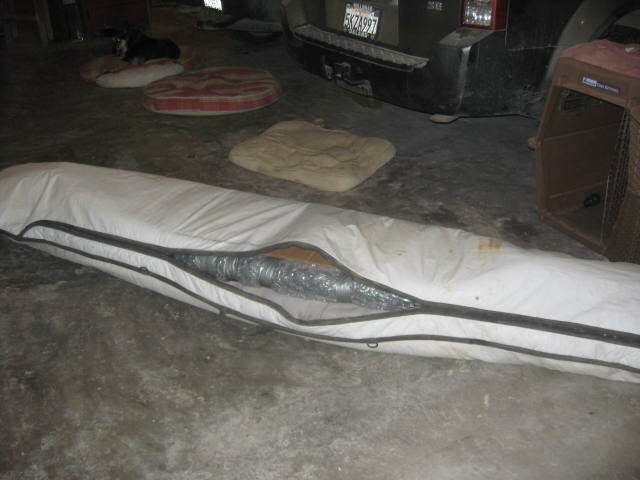 They were so tight that it was necessary to lie on the bed to get them zippered and often a metal clothes hanger was necessary to draw the zipper closed. Well, that’s the memory conjured by the first attempt to close that board bag. The two zippers stopped short of the closed position and the bag lay there still open in an open-mouthed Rolling Stones-esque taunt. I try adjusting the boards’ position in the bag so that their widest point is aligned with the widest section of the bag. I remove the board bags added for extra cushioning. Still too tight. And then I remembered Lady. When I was a kid, my Aunt Lillian had a horse named Lady. Like any red-blooded Canadian girl, I loved horses and loved to ride, but sadly Lady hated to be ridden. She would do everything in her considerable power to avoid being ridden or to stop the rider short. She would refuse to walk or she would get you to the far end of the field and then start to buck like a rodeo bronc. But her favorite and most common move was to fill herself with air as we saddled her up and then as we’d walk through the field she’d slowly empty herself with very smelly and saddle-loosening results. If the rider wasn’t careful, she could end up sliding South with the saddle and dumped on the ground under the horse. The extra air between the boards in the form of multiple layers of bubble wrap was acting just like Lady’s air-filled stomach and would have to go. So, “pop!” they went as I squeezed them like so many pimples on an acne-faced teenager. Gradually the space between the two boards shrank and, low and behold, the board bag closed. No wire clothes hanger required.